Milo Yiannopoulos was permanently banned from Twitter in July of 2016 for his trolling of Leslie Jones (one of the actors from the then recently released Ghostbusters film reboot). Among other tweets, Yiannopoulos had said, "Ghostbusters is doing so badly they've deployed [Leslie Jones] to play the victim on Twitter". He then described her reply to him as, "Barely Literate" as well as calling her a "Black Dude". From a nonverbal communication perspective, there are a good number of tells in the recently posted interview (above). One of these is analyzed here. Beginning at 1:09, Yiannopoulos says, "I like to think of myself as a virtuous troll, you know - I'm doing God's work." 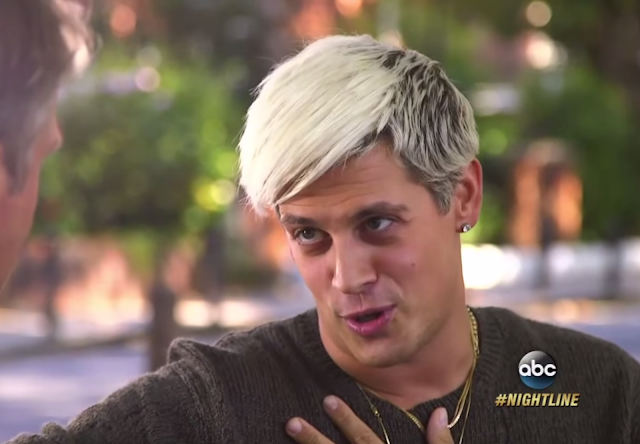 During the second half of his answer, Yiannopoulos displays a nonverbal expression cluster which is a colossal red flag. The image below is a screen-grab captured at 1:12 - just at the end of the word, "... work ...". Note Yiannopoulos' elevated central forehead - which is more pronounced on his right. Along with this central forehead contraction he's also displaying an elevated right eyebrow and a partial mouth smile. Moreover his head and neck are flexed forward and tilted to his right. This cluster is strongly indicative of insincerity - AND it strongly contradicts his verbal message. Whenever a partial mouth smile is seen in conjunction with elevated forehead contraction - particularly a central forehead contraction (Elevated CFC), one thought emotion which should always come to mind is disbelief. Moreover, his incredulous emotional tone is further amplified by his elevated (right) eyebrow. Now look at his left hand - it's placed over his RIGHT chest. The heart is of course on the left. Even if a person unaware where their anatomic heart is - when they touch the opposite side of their chest in an effort to express their metaphorical heart - it's a ruse. It's acted. It's faked. It's a lie. Milo Yiannopoulos is insincere when he says, "I like to think of myself as a virtuous troll, you know - I'm doing God's work." Of course a person may really believe they are doing going God's work - but Yiannopoulos is lying.